You know what Thursday? I think you’re mint. I believe most people feel the same, but haven’t really consciously acknowledged their adulation for you. Saturday and Sunday, “The Weekend”, are the sovereign days that rule as king and queen, and people are usually thanking some deity for Friday. Monday gets a mishmash of loathing and embracing as the beginning of the professional work week. Tuesday is the day you have to put the trash out or attend some seminar and isn’t nearly close enough to next weekend. Wednesday, fondly referred to as “hump day”, is a midweek wildcard that can derail the rest of the week… and statistically speaking rarely delivers on its nickname’s promise. But you Thursday, you are adaptable, welcoming, and fun. You’re there for a long weekend. You turn the beginning of the week into a distant memory. You’re a good travel day. You’re a great study and all-nighter day when something is DUE on Friday. You’re a good date night. You’re an ideal day for a gathering of friends. You’re even given a holiday every November. Thanks Thursday. 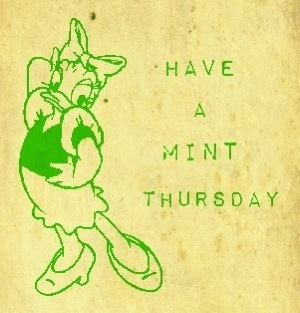 Thanks for being a mint of a day.